Its no big secret here, my budget forces me to either recycle my music or to get creative with my approach to increasing my collection. And, believe it or not, I still have about 15 old 8 tracks, a couple of hundred cassettes and around 75 music cds. I kind of like to keep my music. I do manage to purchase some cds each year but those are the ones I want so that I can have something physically in my hands. Online free music streaming websites are where I find my music and where I store it. Music streaming websites all offer free music and have premium services available. Some even offer more advanced services but I have found that the free music service is more than sufficient for my needs. Some are more easy to use, but that may be just because they are my usual go-to sites. As with most things, the more familiar I am with something the more often I turn to it. HerbertSkillz Beats from Cheshire, United Kingdom has a great track out, soft Acoustic Guitar & Piano relaxing instrumental. Musixhub was designed to enhance your YouTube experience by giving you easy and unlimited access to the music of your choice. The Musixhub platform lets you watch videos and play music from your favorite artists -full albums / the latest videos / interviews / live performances and more. Jango has 43 categories which include s a selection of decades from the 60s to 2010’s. Each genre is broken down even further, again music for every taste and preference. Jango includes a good biography for the artist/band and includes the lyrics. MixCloud not only has a huge collection of music but has 10 categories of talk shows ranging from business to comedy. The categories have a big selection of language choices, an international mix that spans the world. Sound Cloud lets people discover and enjoy the greatest selection of music from the most diverse creator community on earth. Launched in 2008, the platform is known for its unique content and features, including the ability to share music and connect directly with artists, as well as breakthrough tracks, raw demos, podcasts and more. Sound Cloud is an open platform that directly connects creators and their fans across the globe. Music and audio creators use SoundCloud to both share and monetize their content with a global audience, as well as receive detailed stats and feedback from the SoundCloud community. YouTube allows users to upload, view, rate, share, add to favorites, report, comment on videos, and subscribe to other users. It offers a wide variety of user-generated and corporate media videos. Available content includes video clips, TV show clips, music videos, short and documentary films, audio recordings, movie trailers, live streams, and other content such as video blogging, short original videos, and educational videos. Most of the content on YouTube is uploaded by individuals. 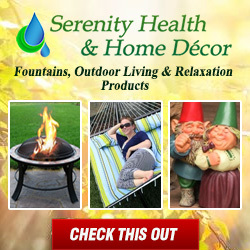 Serenity Health & Home Decor features some of the best home decor I have seen. I think the indoor table-top fireplaces are fantastic! A warm inviting fireplace that fits in small places. These indoor tabletop products are gel-fueled personal hubs of warmth that won’t produce smoke and soot. The eco-friendly units are odorless, too. The modern design of a tabletop fireplace creates a beautiful look for your home, vacation getaway or apartment. I tend to use YouTube quite a bit, especially for music to share here at my blog. The biggest downside that I have found is the sheer size and the volume of music and other videos. Sometimes, the struggle to remain focused on finding the right music is lost to other interests. SoundCloud is my favorite for finding music that is new or that just has not got the recognition it deserves. A lot of great artists have made their music available under the Creative Commons licensing. I use the other streaming services when I am doing research, studying or just hanging out. I like being able to select a time frame or particular type of music and just hitting play. I have no idea how many free streaming music websites there are, I do know that I have only touched the tip of the iceberg with these. Where do you get your online music, free or premium services? This entry was posted in Music, Products. Tagged free streaming music, music, online music. I am really a dinosaur regarding how I listen to music. I’m and American who has lived in Asia for more than 30 years. About a quarter of that time I had very little access to media. As a result I am out of touch with the modern music scene. I discovered iTunes radio a few years ago and finally got a vpn during my years in China a couple of years ago. I now use youtube for most of what I listen to, which is music more than 20 years old. I guess I need to get up to speed quite a bit. I’ve lately discovered Spotify. It looks like from your presentation that Pandora, Soundcloud and your Relaxation and Meditation are all worth investigatin. Hi Joe, I know about dinosaurs! When I breakout the old 60s/70s Southern Rock my kids act like it is the Stone Age (which in a way I guess it was!) but they get into it. YouTube does have a great selection of the older stuff and remains the 1st site I usually start with. Thanks for including the R&MM; in your searches, I’ll hopefully get some great music added for you! They are some really good music sites you have shared. I find stuff on Youtube, (more the meditation and personal development stuff), but I also like Spotify. It does have a free service but the ads are a pain. It is quite inexpensive and with a family of 5 we share the cost so it isn’t that dare at all. I really love it and is something I listen to on my phone every day! Hello Sharon, Spotify! Now how did I miss that one? I use it also (free service) because some of the younger New Age artisst that I follow upload there. Ads are the bane of our lives, I can’t get away from them even on my own site! Cost sharing is a great way to make the budget go longer! I do like the meditation videos n YouTube, easy to save and review to get the most benefit from! Nice work Sanders, I had no idea that there are so many different streaming websites for music. I myself have been using spotify for a couple of years now and I love the fact that I can access my music from anywhere and even download it and listen to it offline. My band used to put music up on Soundcloud and you are right for finding new music and not the mainstream stuff it is great. By the way do you know the track from Dwayne Wyer it is a meditation song that I used to listen to all the time. Worth checking out if you haven’t already. Hi Hendrik, I use Spoyify also, just missed it when I was doing my list. Online music playlist or channels/stations are geat, I never worry about carrying disc around anymore. Just keep the passwords and listen where ever I am. I’ll have to see if I can find your band and check your music out. And thanks for the tip on Dwayne Dyer, got him on my next search list. I personally use YouTube for most of my music (I like to watch videos and the lyrics). The one issue I have with YouTube is a lot of what gets posted is remixes and covers, so sometimes it can be hard to find the originals. In your experience which service has the least free ads? Nate, The covers/remixes can be a little disturbing sometimes. But, YouTube is YouTube and it happens on some of the other music streaming sites also.For original I usually look for the “Official” stamp. Fewest ads? Tough call on that, but I think the last time I was on Musixhub the ads didn’t bother me. Hard to say, maybe I am getting immune to them! beautiful track from herbertzkills you put on there. I listened to it as I was reading your article. Thanks for compiling this list of ways to listen to music online. I have heard of a few of them but I’m surprised that there are so many that I haven’t heard of. Personally, I use a paid monthly streaming subscription just because it allows me more customization and ability to listen to exactly what I want as compared to many of these free services where you often have to listen to playlists instead of the exact song you want. Although I do occasionally use them to find new stuff that I like. Hi Mariah, So glad to hear you liked herbertzkills, I like it, another great artist that goes mostly unheard. I know what you mean about the ability to customize and get exactly your music. It is wonderful to have and to be able to go directly to that one song. SoundCloud may not be as polished as other sites but it offers the best in new or seldom heard artists. Thanks for stopping!